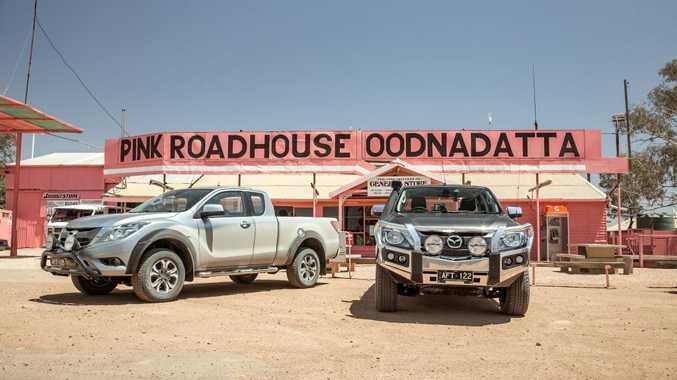 OUTBACK ADVENTURE: Starting at the Oodnadatta Roadhouse, the Mazda BT-50 utes were thrown across sand dunes, dry river beds, rock slopes and gravel tracks. FOR many of us, Australia's great outback holds mythical appeal. 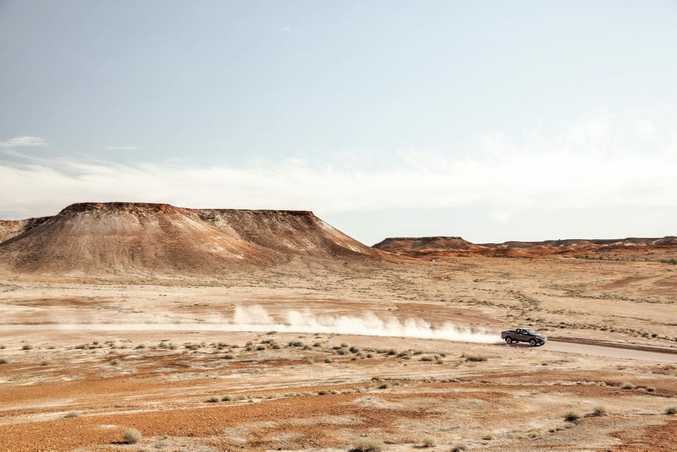 We've either spent time in our sparsely populated interior and been captivated by its vastness, its colour and serenity; or as outback virgins, longed to escape our comfortable urban lives and discover its power for the first time. I was a teenager when I first saw Nicolas Roeg's 1971 film Walkabout. I was sitting in a cold, dark front room with freezing wind and rain battering the windows of my family's suburban London home, and the outback's sun, endless skies and red desert all looked paradisaical. A harsh paradise, granted, but the almost hallucinogenic heat hazed cinematography - the brutal beauty of the scenery - simply mesmerised. Half a lifetime later and I'm wandering across the tarmac at Coober Pedy's tiny airstrip, the local flies already feasting on the sweat from my face as the mercury heads towards 40 degrees Celsius. I've explored parts of our interior a number of times before, but Australia's opal capital - 846km from Adelaide - feels somewhat more remote. More wild and unforgiving. There's certainly barely a soul to be seen in this outback outpost. From under hats and fly nets emerge a mob of Mazda branded folk. 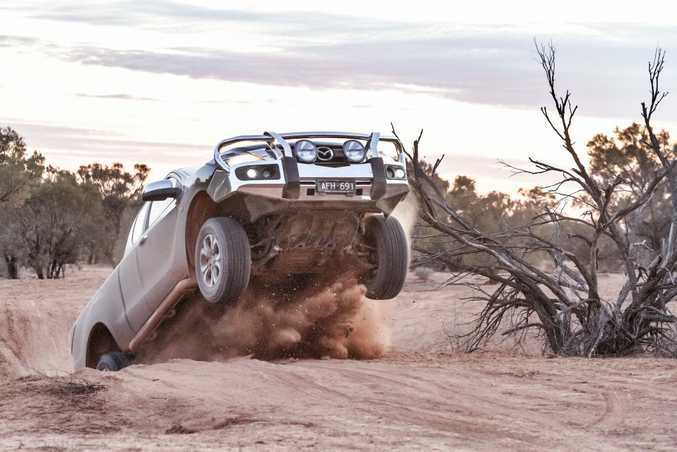 With them a brace of 4x4 BT-50 utes, enlisted to guide us motoring hacks on a two-day driving adventure through the South Australian outback and some of the harshest terrain and conditions this great land can throw at us. Not quite as genuine as David Gulpilil leading us on foot to safety across the desert a la Walkabout, but the kilometres would be dispatched in far greater comfort, ease and speed. And a cabin with air-conditioning, chilled water and even some sucky sweets on hand? Well, it's the modern way of outback adventuring. The road trip was to give us a feel for the talents of Mazda's recently refreshed BT-50 in 4x4 Dual Cab and Freestyle Cab variants. The new model arrived in September with a tougher looking front end (a redesigned bumper, grille and headlights), new rear lights and alloys, updated infotainment and reverse camera for the top grades. Dressed with bull bar, spotlights and snorkel, our steeds certainly looked battle hardened, helping shake off any belief that the BT-50s of old looked a bit wimpy compared to our current crop of mighty utes on the market. The BT-50's solid reputation remains. 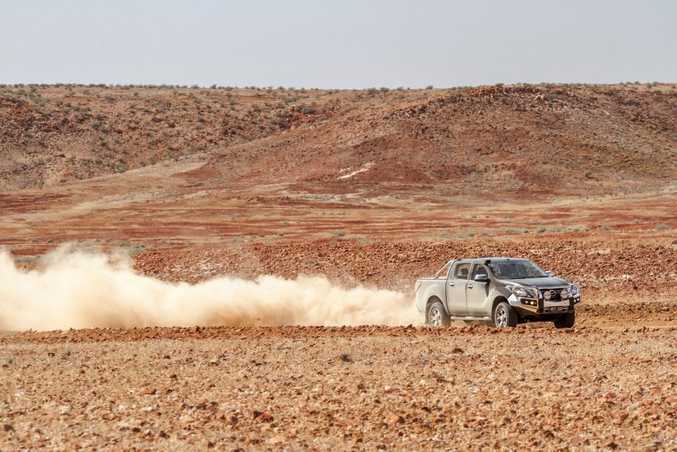 It still features the tried and tested 147kW/470Nm 3.2-litre five-cylinder engine, silky six-speed auto and suspension as before, all of which have helped Mazda's ute maintain a loyal following smitten by its all-round talents. But the outback is a test for any vehicle. We roll through the dry and dusty outskirts of Coober Pedy - it looks a quiet day in town - and are soon on the gravel towards Oodnadatta. It's flat, featureless and red to the horizon where a flat line meets pale blue sky. It's oven hot outside the BT-50. No wind, no sound and no respite from flies that take only seconds to start sucking your on-skin moisture. Each of us is temporary home to hundreds of them. The idea of walking this land suddenly holds little appeal. It makes the ease of driving it a true guilty pleasure. The road here is superb for an unsealed section, and the BT-50 impresses at how well insulated it feels - barely a bash can be felt on the underside with stones kicking up - and sitting at 110kmh is never in question. The Mazda feels as confident here as you would in an S Class Merc on the highway. Oodnadatta and its Pink Roadhouse loom into view after 230km. Out front is a long unused 1950s International pickup that refuses to rust away in a place claiming to be the world's driest. Leaving town we arrive at the BT-50's first real test. A claypan - a flat, red circular playground with soft sand dunes to one side. After a few minutes playtime on the pan (when in Oodnadatta...) it was in to 4L (4WD low range) to attempt the sand dunes. Steep, churned up and super soft, the BT-50 nevertheless carved a path to the summit. Impressively, this was still using its standard tyres set to 30psi. On to the aptly named Painted Desert for some dry river bed driving, deep with large and loose rocks. In low range once more the Mazda ute crawled its way through faultlessly, refusing to show signs of strain. The sky a soft pastel box of hues as the sun slipped behind the clouds, I reflected that being able to confidently tackle such terrain allows us to experience such sights. We are truly spoiled by the smart technology in our modern utes. "Go anywhere" is an oft overused phrase, but the BT-50 had tackled everything asked of it so far, and we'd not been holding back. Billions of stars blanketed our Arckaringa Station overnight camp, before an early start had us back in the comfort of the BT-50 for a route taking in parts of the famed Oodnadatta Track. Impressing me most was the BT-50's surefootedness along twisting gravel roads - a mix of solid and sandy tracks - where the stability control proved its smarts constantly. 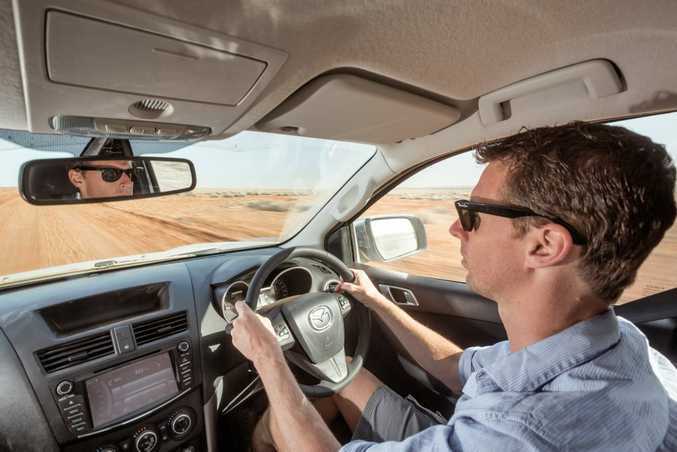 Eating through kilometres safely in these parts - where long distances are the norm - is integral, and the Mazda offered an excellent blend of assurance and a good dose of fun. The five-cylinder diesel offered solid grunt - the mid-range torque really impressing - and the six-speed auto seamlessly swapped its cogs to again keep progress almost effortless. Then the hardest trial: rock climbing. Once again in low range we were let loose on a testingly steep, loose rocked ascent. The BT-50 felt braver than I did at times, eager to attack at frightening angles. Descending and it's all about letting the Hill Descent Control take over the thinking. Feet off the pedals the ute crawled down the climb, once again keeping we occupants in impressive comfort. How we didn't get a puncture across either day, in any car, gave great reassurance. That second day we passed just one other piece of traffic - a road train - illustrating that perhaps not every dual cab ute buyer needs the likes of radar cruise control, blind spot monitoring and forward crash alert, things the BT-50 has been criticised for not including like some of its rivals do. 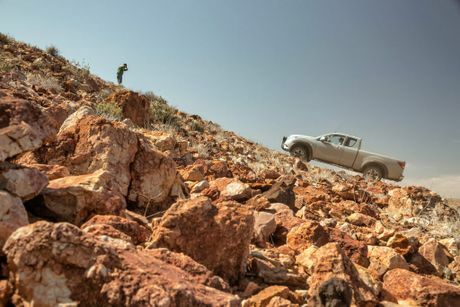 After about 550km of outback adventure, the BT-50 felt like it offered the true safety needed in these parts, namely surviving a range of tough terrains without a reliability issue. 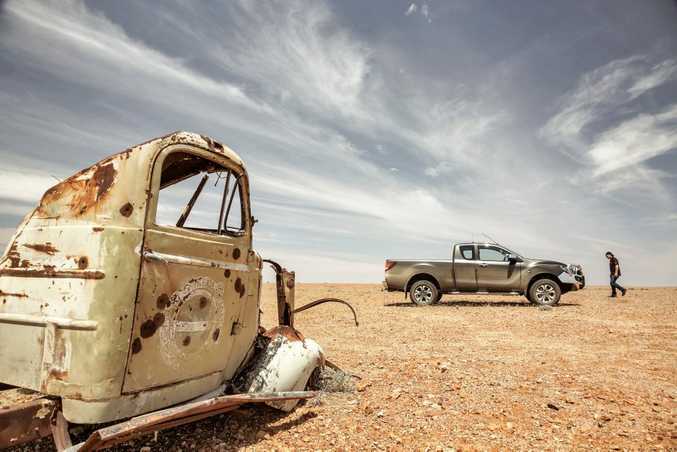 In fact, parked up at the Coober Pedy underground cafe, the utes barely looked as if they'd left the asphalt, save maybe for the two-day coating of red dust. The outback is still the harsh land I saw in that movie all those years ago, but travelling across it with almost guilty ease has given me a new found respect for Mazda's BT-50. Comfortable and quiet on gravel, balanced and confidence-inspiring through turns and such 4x4 capabilities that make it fun rather than frightening on the really rough stuff. For those brave enough to live in our majestic outback, or adventurous enough to journey it, these are the things that truly matter.